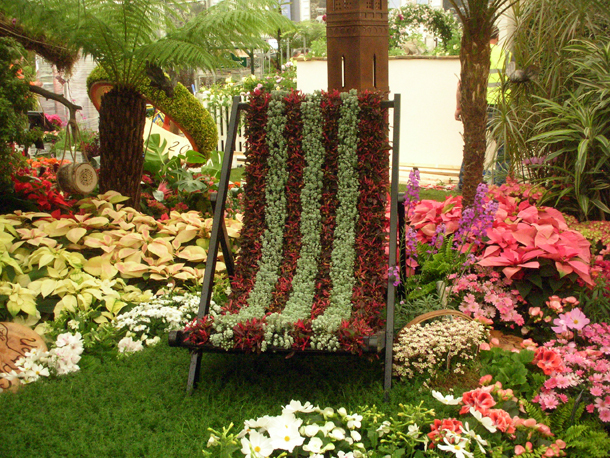 A month ago I had the privilege of getting a pass to see the centenary Chelsea Flower Show a couple of days before it opened, and before the glitzy & glamorous strided through the doors. Many were still in the thick of setting up, power water misters seems to be the order of the day and the finesse of the work went down to people brushing soil off plant leaves with a paint brush. 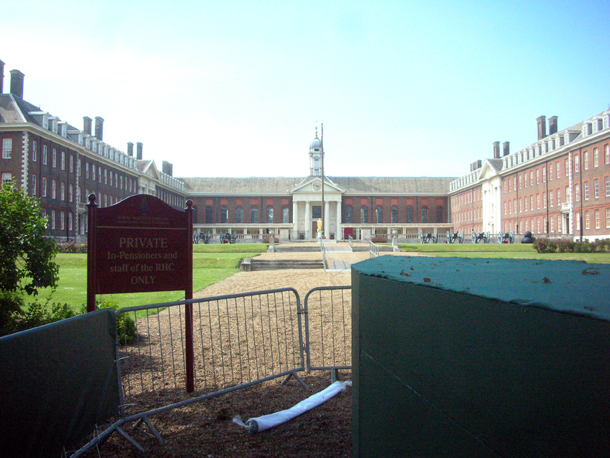 The interesting site of the Royal Hospital where the show is held. 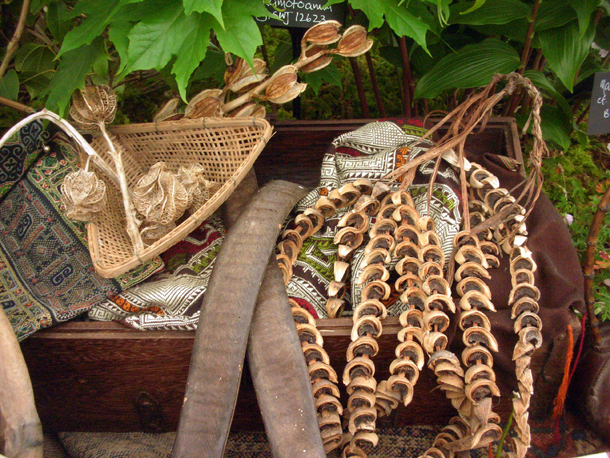 A few nurseries has been at the Chelsea Flower Show all the way, including orchid nursery McBeans. 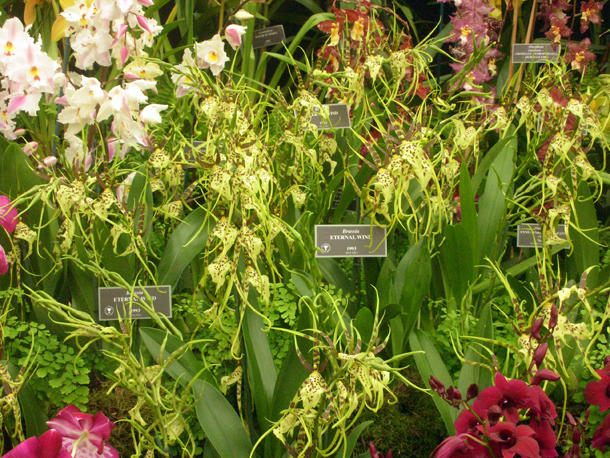 They recreated the first showy stand that they did of exotic orchids at the first Chelsea Flower Show, but now with even more genera. Perfect lupins. 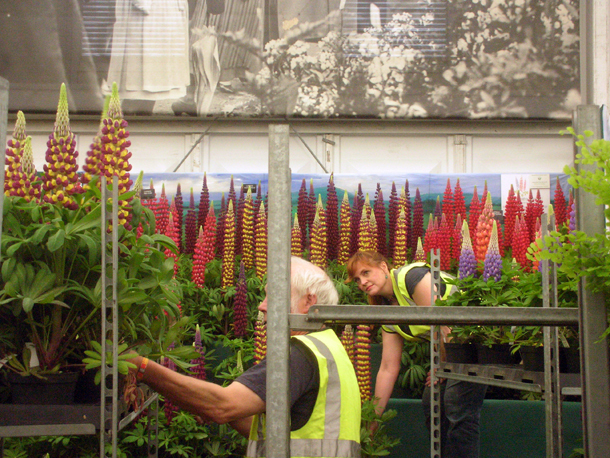 It's mind boggling to think how they manage to get plants ready and in such top condition exactly for the dates of the exhibition. All sorts of keys & secrets I'm sure, hence the method known as the 'Chelsea chop' & probably some deep freeze action. The building of a stand. 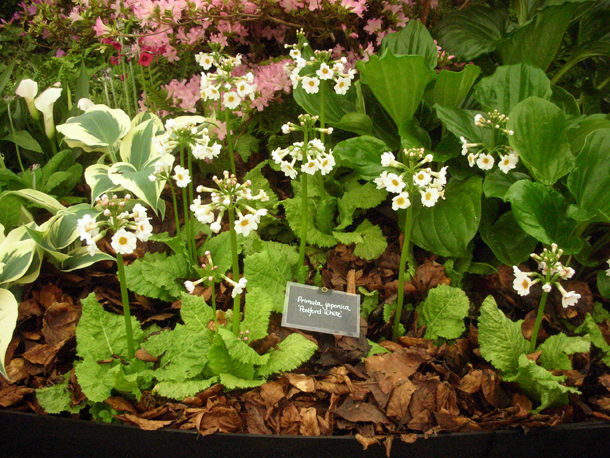 It never ceases to me amaze me how niche horticulturalists can be, from heuchera lovers to just being dedicated to one type of primula or even strawberries. The range of specialism was impressive. 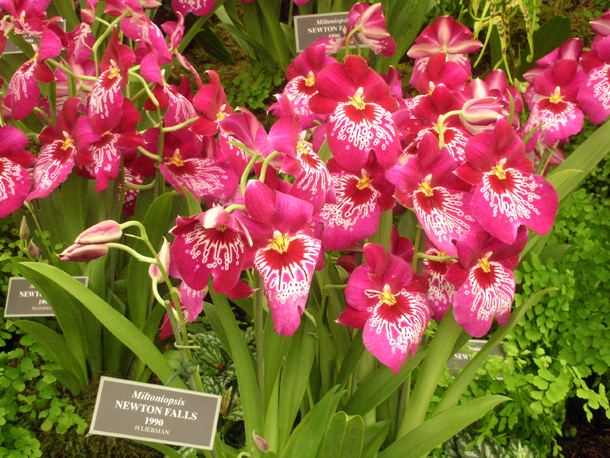 There was of course stands by famous nurseries like David Austen roses & Cayeau irises. The smell inside the marquee of all these plants was phenomenal. 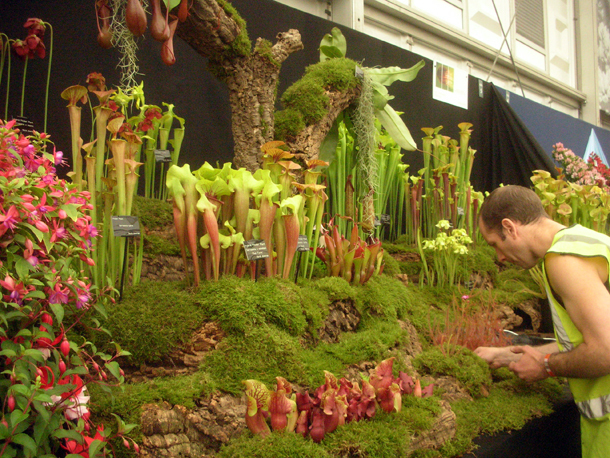 Here is the carnivorous plant stand being tweaked. 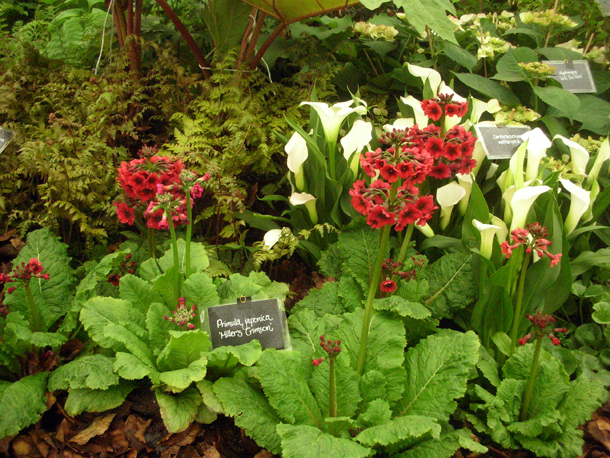 Nothing satisfies me more than seeing three grown men getting particular about primula auriculas, breaking stereotypes in a positive way. 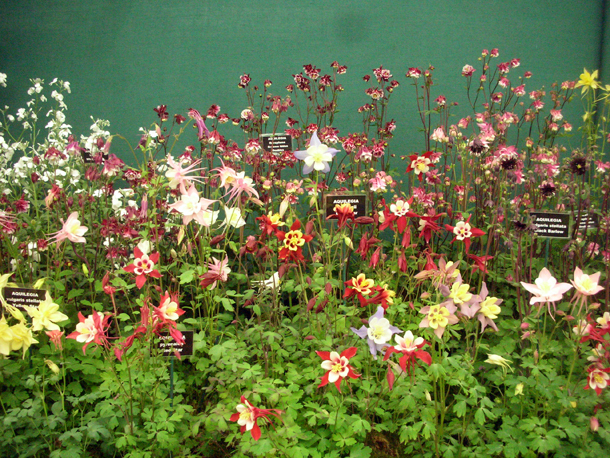 I couldn't help but admire these aquilegias. Not to mention one of my favourite nurseries 'Crug Farm' with their daring exotics from their intrepid plant hunting expeditions. One of their latest adventures was in Vietnam, which as the birth place of my parents I am very interested in. 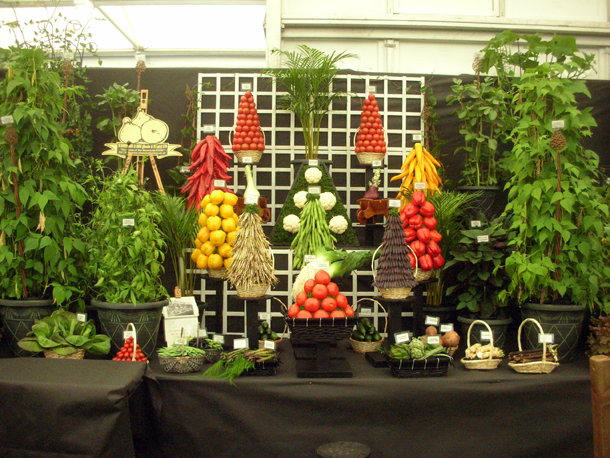 I am intrigued by how these vegetables are displayed, it is like a shrine for a harvest god. 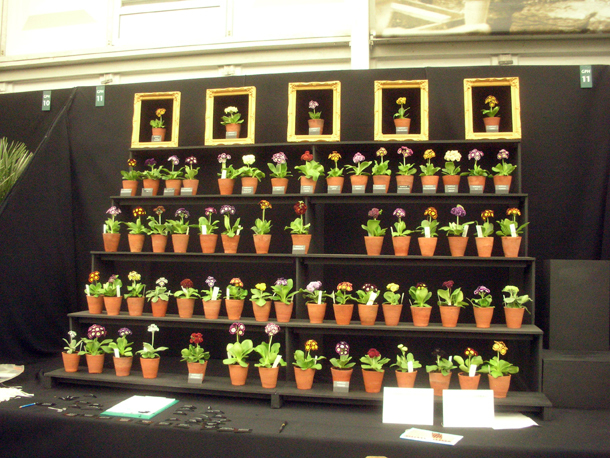 I have a thing for chandelier/ tiered primulas for some reason, so I was curious to see the different types on display (there was many). 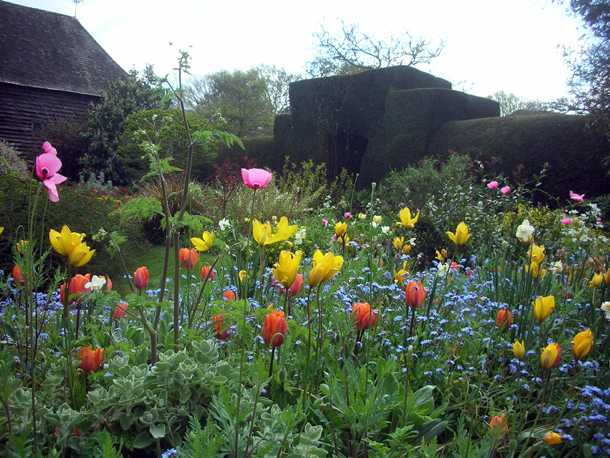 I loved the lush planting/ display of Hillier. 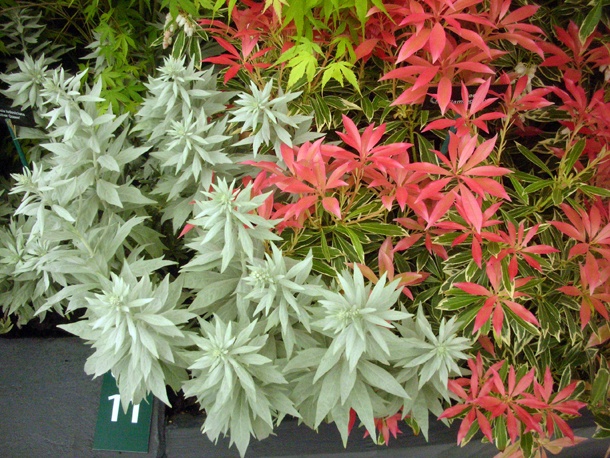 They had great plants & combinations and made it feel like a bit of a feast. This is the first time I have seen rhododendrons pruned this way, almost as standards with some of their leaves stripped off. 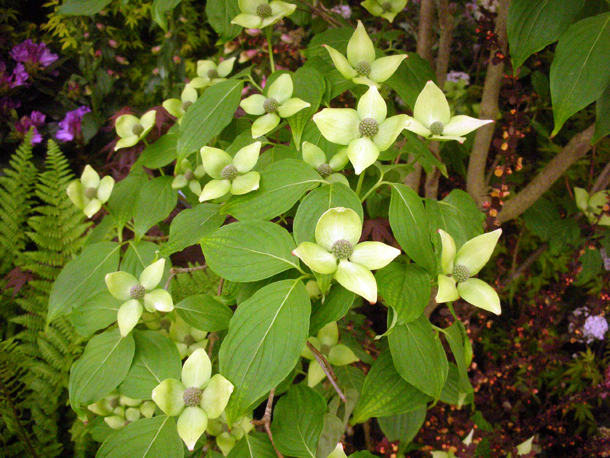 This Cornus kousa was one of many plants that I saw on my desire list. 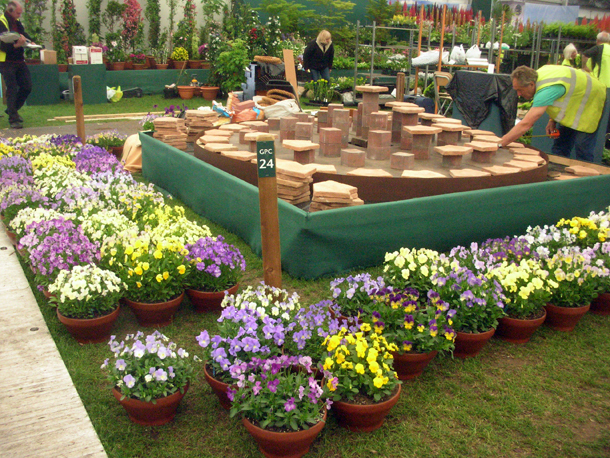 There were many other things going on in the main marquee too, different societies, RHS demonstrations of different gardens throughout the last 100 years and intensive floral displays by Birmingham Council and Nang Nooch Botanical Garden in Thailand. 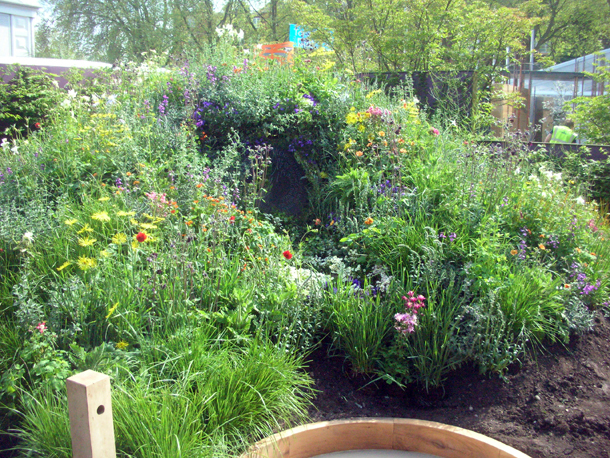 I was not as taken with any of the show gardens as I would have liked to have been. 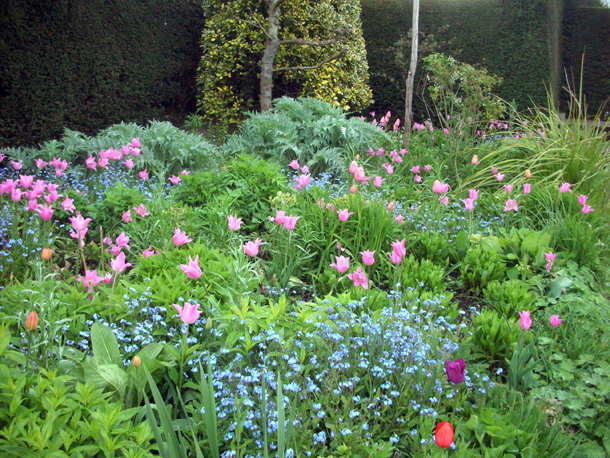 I liked Chris Beardshaw's planting that he did with Arthritis Research UK, especially the tall echiums. 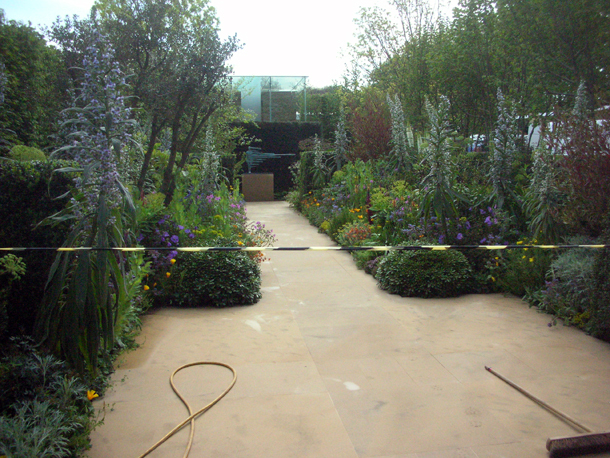 A lot of the show gardens used this light flooring which I think was a type of york stone. I was wondering though if it was giving everyone a headache, as footprints & dirt seem to show up really easy on it. 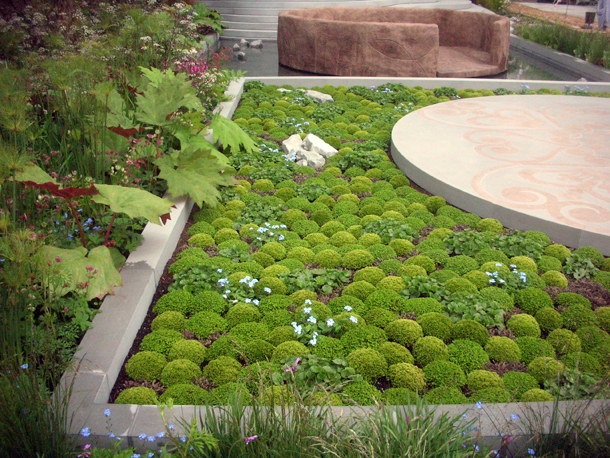 There is a big trend at the moment in green roofs, vertical growing, dealing with the urban environment and using modern materials. 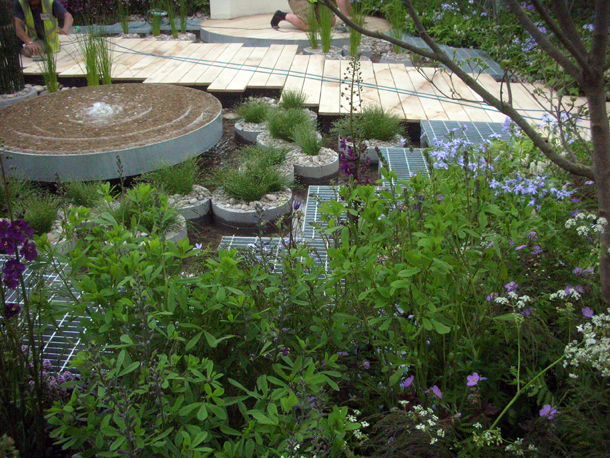 Nigel Dunnett uses concrete to make planters and modern metal grates as walkways as part of his design for a roof garden. I couldn't help but feel that JRR Tolkien's The Hobbit was having its influence to designs too. Birmingham council had definitely highlighted The Lord of the Rings, as part of the celebration of the library that's opening there. If only the LOTR & Tolkien fanatics knew! 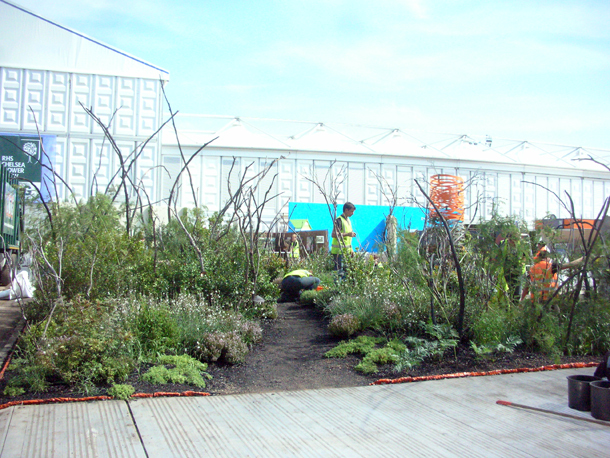 Many of the show gardens were very conceptual, this one was called 'After the fire', demonstrating growth that would occur after a fire and to symbolise a new beginning. 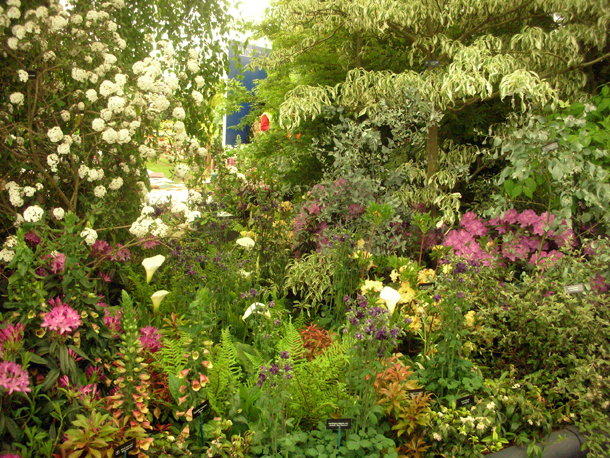 There was lots more, not including the product stalls who made just as much effort to present their wares as did the nurseries. It was only when I had gone home that I realised I had missed the whole 'Artisan Gardens' section, even though I thought I had walked round several times. And I didn't even manage to brush the sides of the Chelsea Fringe this year either. 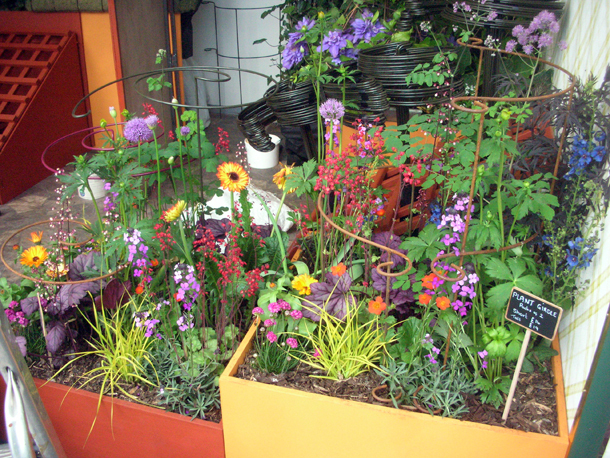 Stalls creating their own planters & cheerful planting. 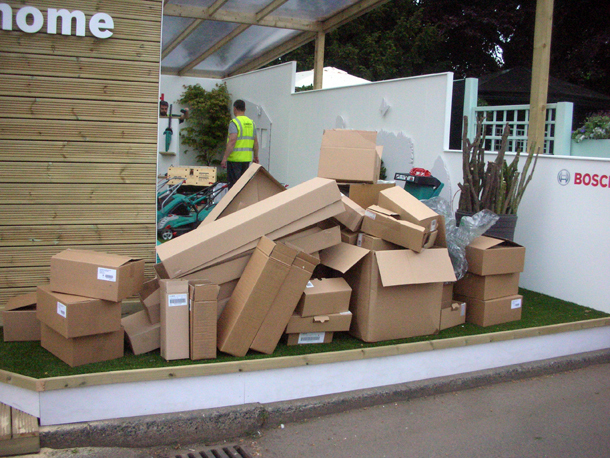 The amount of packaging used was an installation in itself. 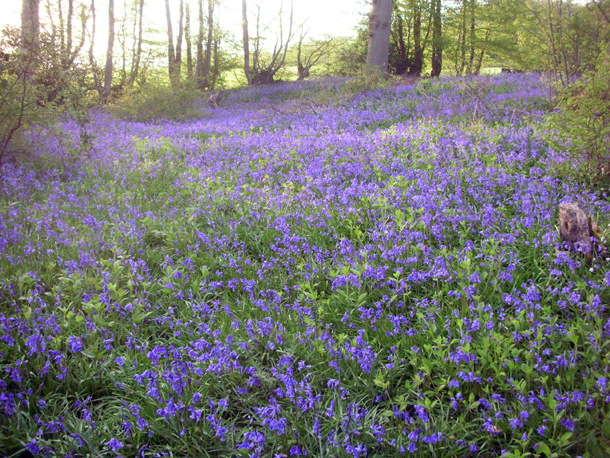 It has not been that long since some of these bluebell woods have finished. The ones around here are the best I have ever seen. 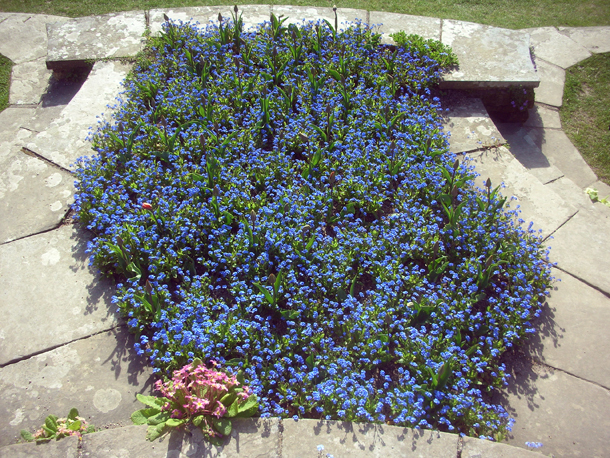 This sparkling carpet was a scene from Dixter's 'Four Acre Shaw'. 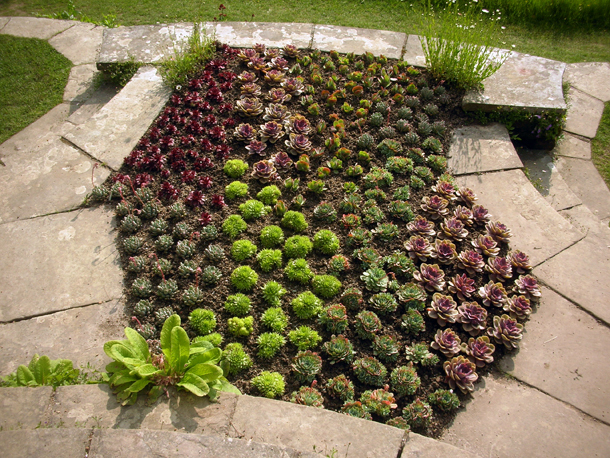 We had the exciting job of planting up the circular step beds with succulents. 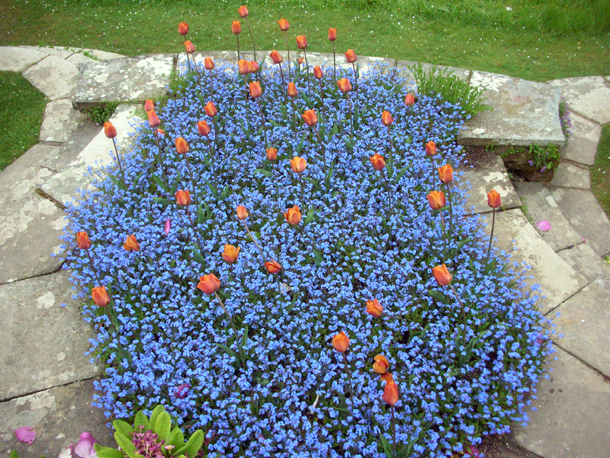 The spring bedding was of forget-me-nots (Mysotis 'Royal Blue') and Tulipa Cairo. 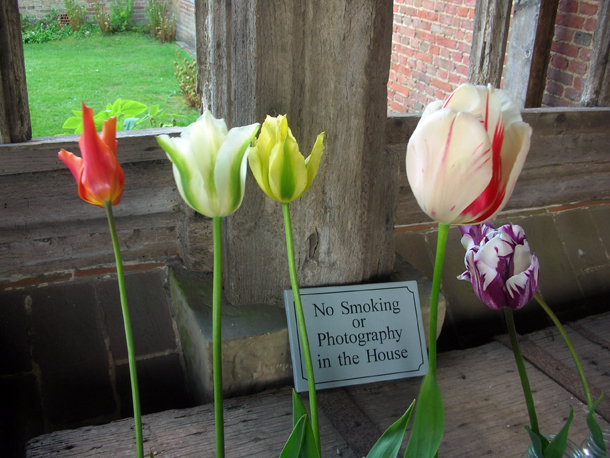 This hadn't worked so satisfyingly because it has been incredibly windy these days so the tulips had been blown to shot not long after flowering. Maybe shorter ones for next year will be better. We tried to work with Fergus creatively in how we laid out the succulents. 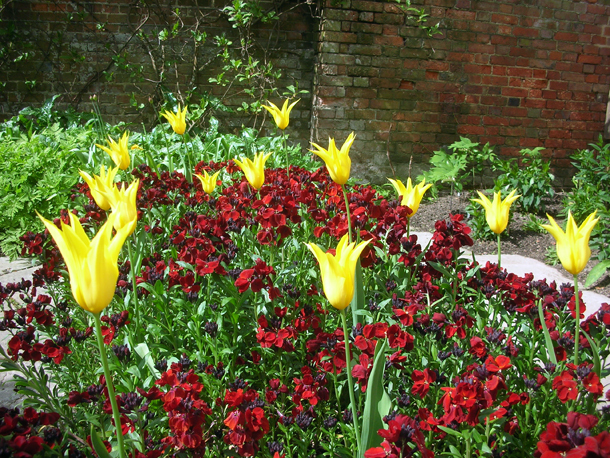 Before doing that we really worked the beds into a fine tilth, as these plants need as much drainage aid in this country as possible. We then laid the plants out when we were happy with their positioning, and tried to plant them in as delicately as possible to not compact the soil. This was no mean feat when the soil although heavily gritted is clay and it being very wet. Weather: 11 - 12°C, possibly peaking to 14°C, a bit better. I had to deal with a series of pests today. First spider mites in the hothouse, these come about when it is hot & dry, so I damped everything down to try and increase the humidity, including the leaves to help create an unfavourable enviroment for them. They are mainly attacking the dahlias. Siew Lee the deputy head gardener has put some biological control in there already, and I tried to wash off the worse of the mites. Hopefully a bit of both will help get rid of them. 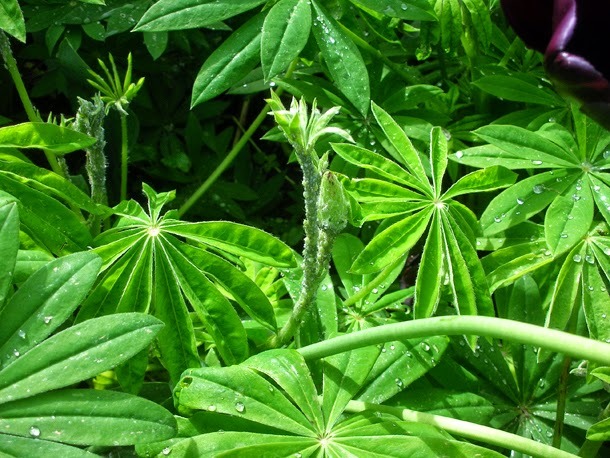 A type of Lupin aphid has also been attacking our Lupinus arboreus, L. polyphyllus 'The Governor' & 'Chandelier', these are much bigger than the average aphid and are white/grey or green when filled with plant sap. We tried to culturally control these by squishing them, but there are actually a lot of them so they may have to be sprayed. Then I potted up some Lychnis arkwrightii 'Vesuvius' - with a name like this it does make you curious what the plant would look like. Some swallows kept me company as I did this in the soil shed - it would seem that they come to nest here annually and dart like a bullet in and out of the door, but quite happy to share the space. 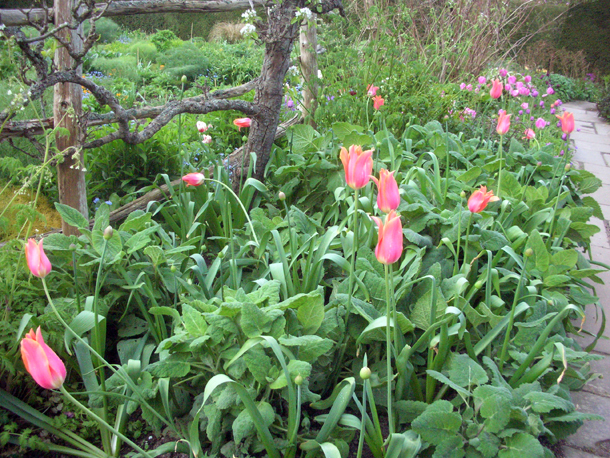 This tulip epic does not represent all the tulips that are used at Dixter (especially the pots), but it starts with the last tulip that's flowering in the garden at the moment. 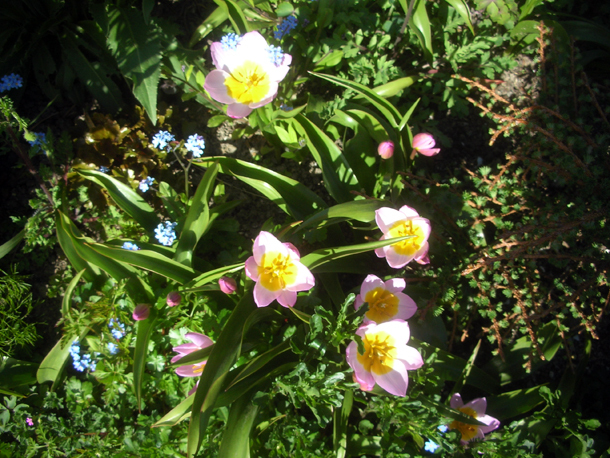 Just when the majority are passing over, Tulipa spengeri springs up as an surprise to carry the delight of these flowers well into June. 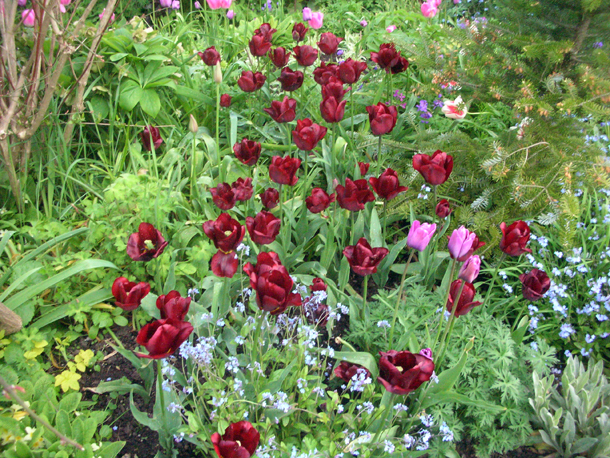 species tulips has much poise & elegance and are have almost bi-colour petals on the outside. 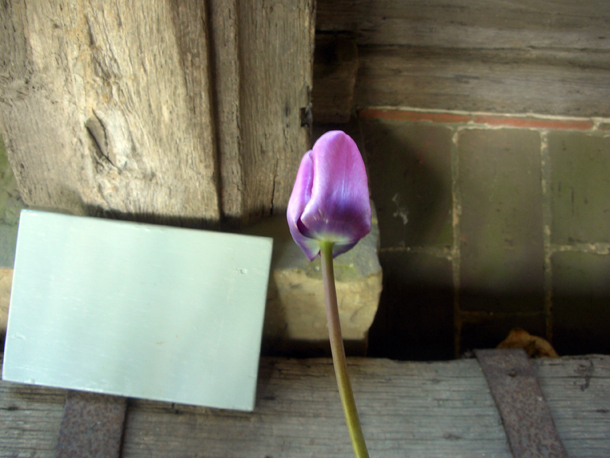 They are extinct in the wild and have the ability to self-sow but it takes them four years to develop into a flowering bulb. 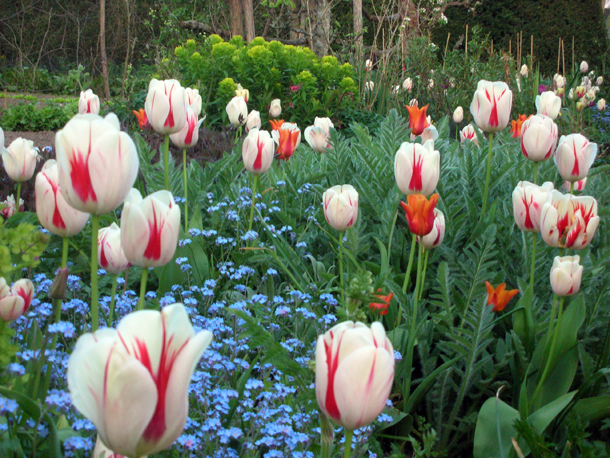 A stunning tulip that lasts for ages. 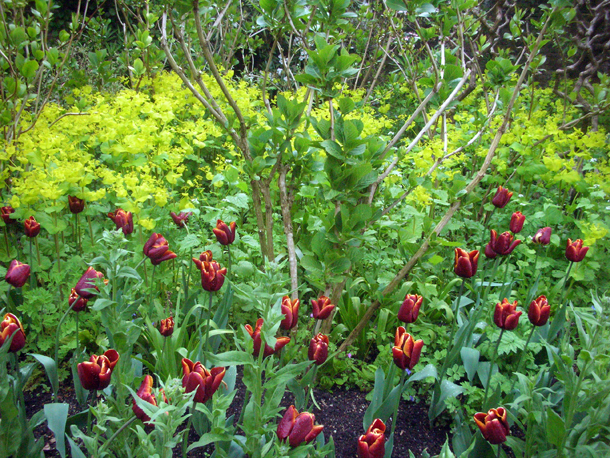 This was a planting that I did last year in the walled garden - to see how it was before click here. 2. 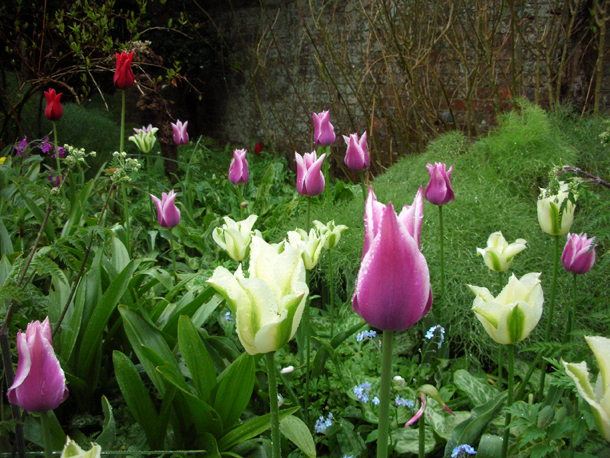 'Spring green' - these were planted in the walled garden - the purple & white versions of these are an accident from the suppliers, they sent out the wrong bulb but labelled the same. 4. 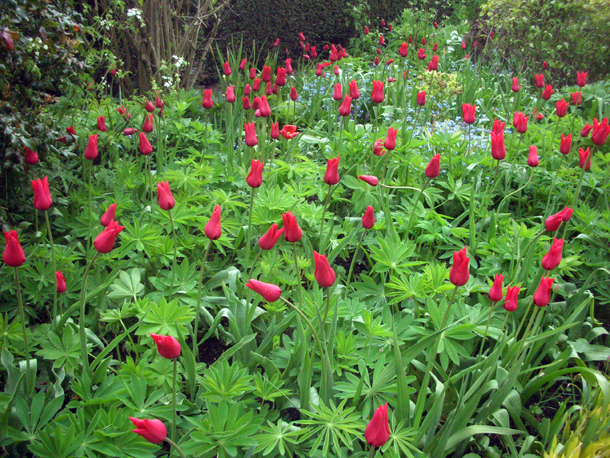 Tulipa 'Bleeding Heart', I think this is possibly one of my personal favourite found in the High Garden (a Dicentra spectabilis aka bleeding heart is also planted in the same bed - possibly done so tongue in cheek). 6. 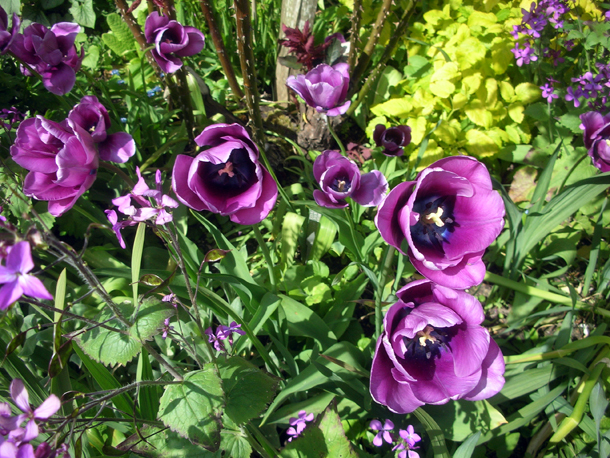 'Bleu aimable' - purple but as if trying to be blue. One that lasts for ages too. 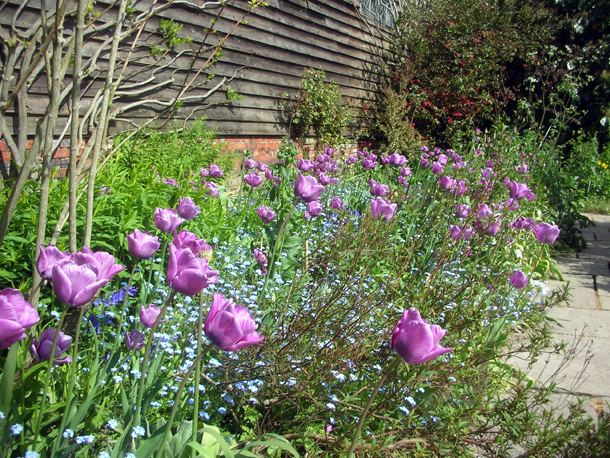 Tulipa 'Bleu Aimable' in the border in the Barn Garden. 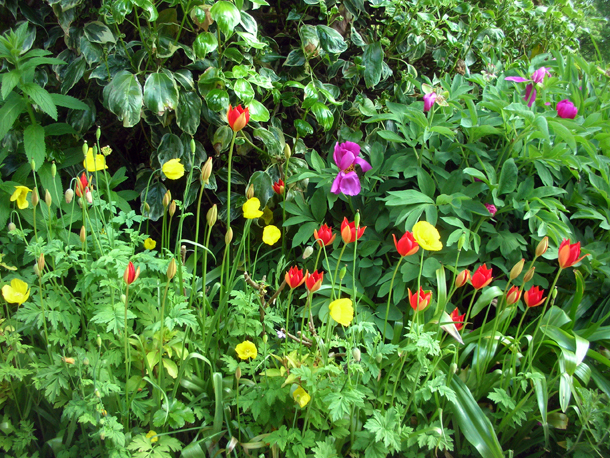 are known as 'triumph tulips' - meaning that they are the result of single early tulips being crossed with later flowering varieties (i.e. 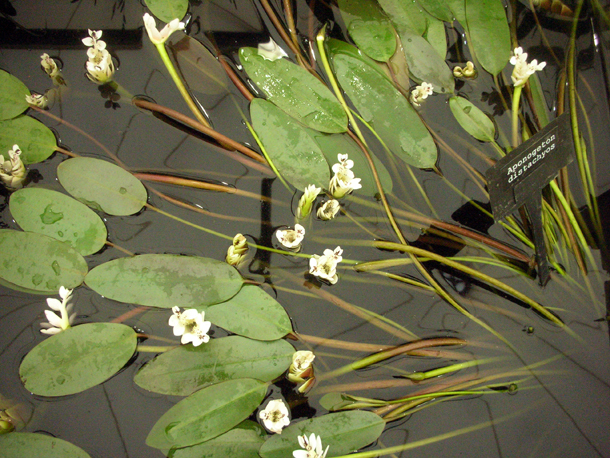 extended flowering time). 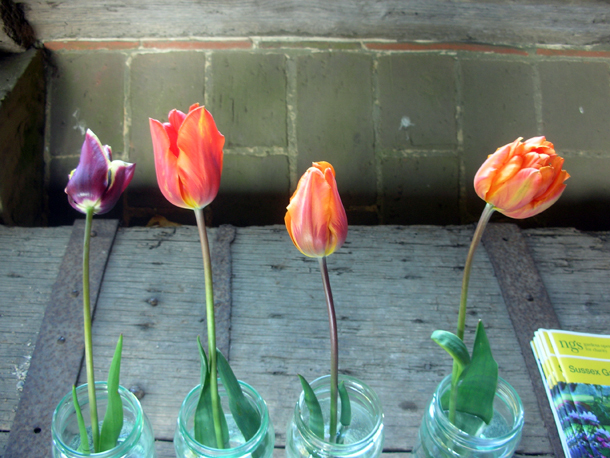 They are usually bred to have sturdy stems. 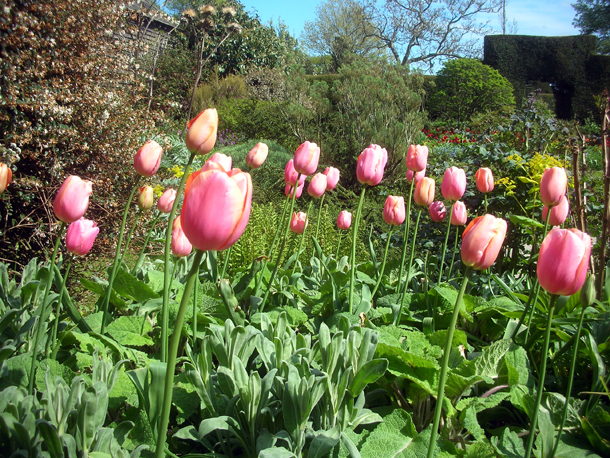 Unfortunately with the high winds these tall tulips 'Daydream' blew away too soon. 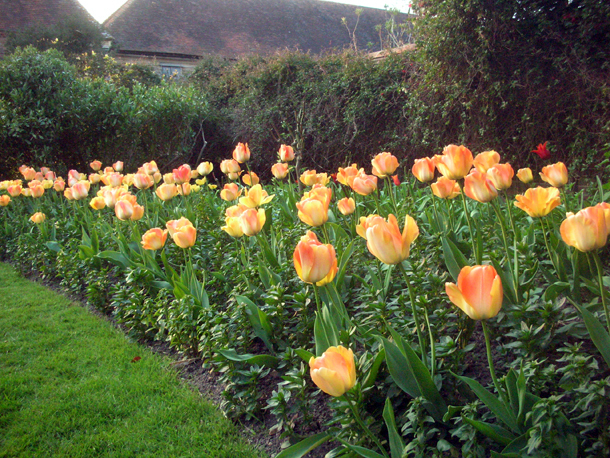 They started off quite yellow then deepened into this warm apricoty, orangey pink colour. 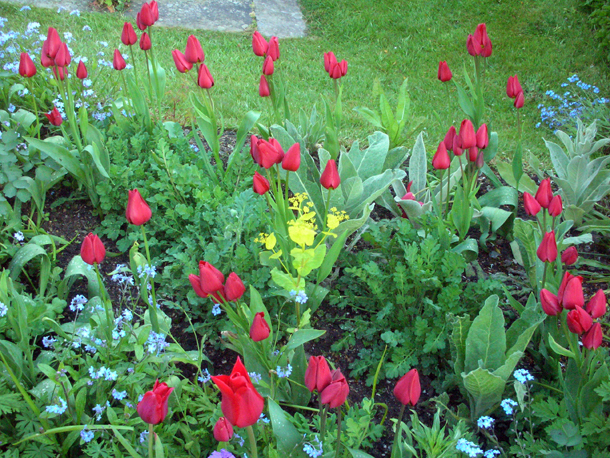 We seem to be having bad luck with tulips in the Solar Garden border, last year many bulbs were pinched by mice. 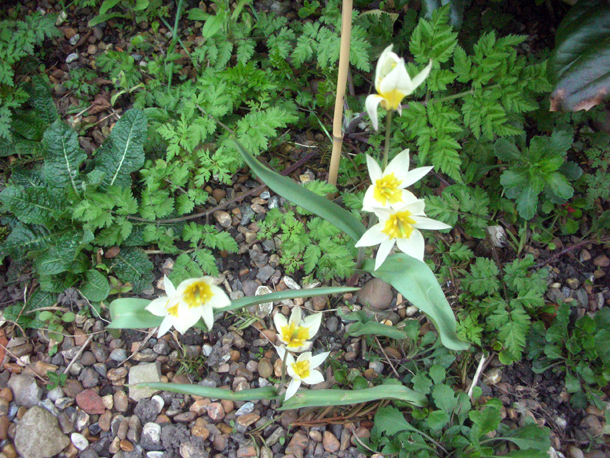 These are species Tulipa linifolia (Batalinii group) Bright Gem, that I planted with Kate last year. We were worried that the mice might have gotten to these too, but looks like there were still plenty left for display. 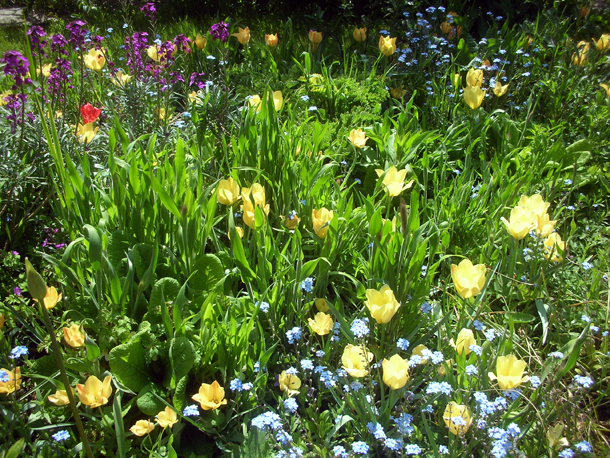 Interesting succession with big species yellow Tulipa sylvestris. Papaver dubium subsp. lecoquii 'Albiflorum' which we just simply call 'Beth's Poppy' as we got seeds from Beth Chatto, gives just that extra height to these layers of flowers. 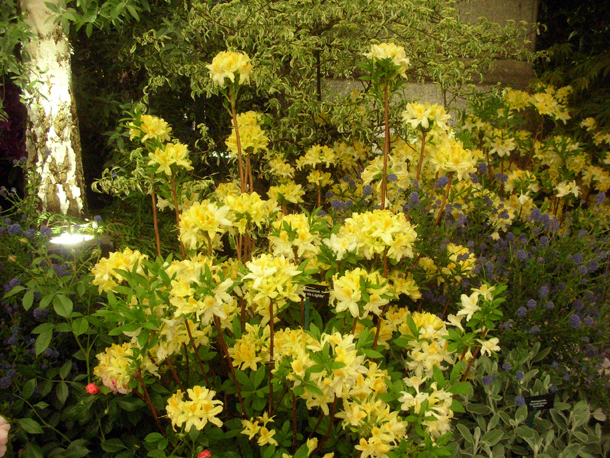 The Barn Garden is probably the fastest changing area, Aquilegia chrysantha 'Yellow Queen' with a particularly pronounced tail has now followed in their footsteps. 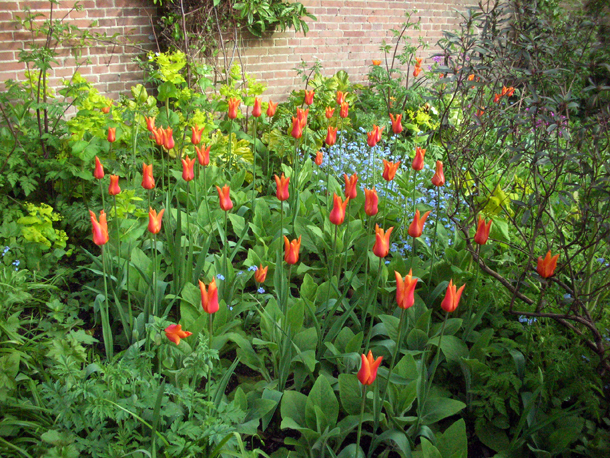 These multi-headed lovelies are 'Red Georgette'. 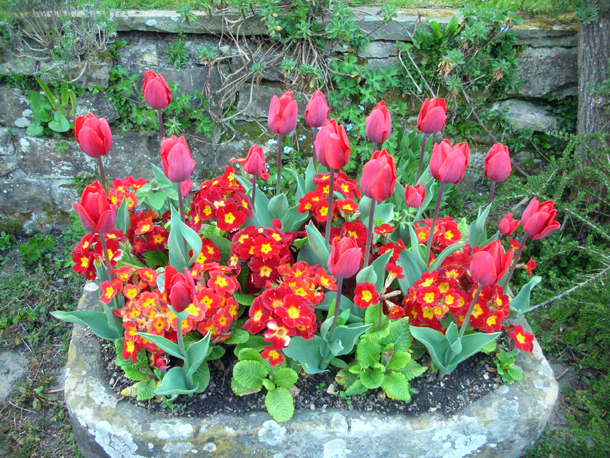 These twisty ones called 'Red Shine' are also another stunner. 'Perestroyka' another big flouncy one that didn't last the high winds so well.